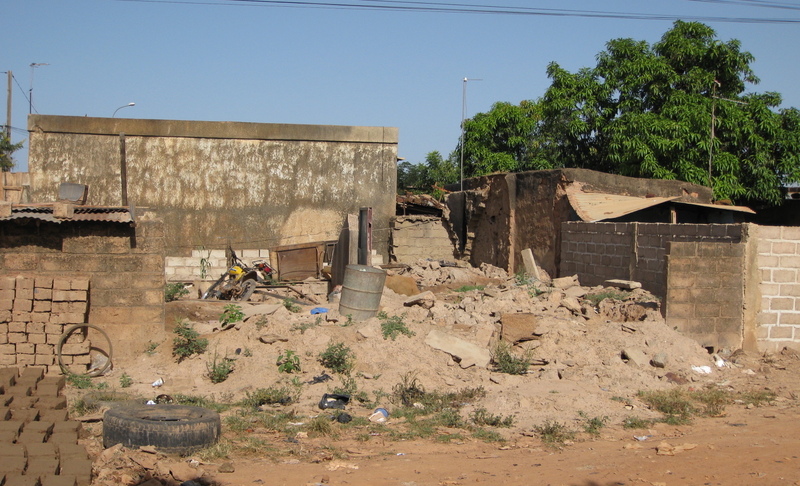 Damage from the September 1, 2009 Floods in Ouagadougou. According to the World Bank, the African continent is home to some of the fastest growing economies in the world. However in the same breath, United Nations Office for Disaster Risk Reduction (UNISDR) asserts that disasters in sub-Saharan Africa are increasing in frequency, severity and impact. On average, almost two disasters of significant proportions are recorded every week in the region since 2000. Few of these ever hit the global headlines but they silently erode the capacities of Africans to survive or prosper. Water, weather and climate hazards dominate the disaster profile of Sub-Saharan Africa, affecting, on average, around 12.5 million people per year. Discussions on disaster risk reduction and resilience have gained momentum and due prominence in the global development arena: even being mainstreamed into development agendas such as the Sustainable Development Goals and Africa’s Agenda 2063. Aspiration One of Agenda 2063 is “A Prosperous Africa, based on Inclusive Growth and Sustainable Development.’’ Set out in the Frist Ten Year Implementation Plan [2014-2023] as a goal to achieve this, is environmentally sustainable climate and resilient economies and communities. Goal 11 [make cities and human settlements, inclusive, safe, resilient and sustainable] and Goal 13 [take urgent action to combat climate change and its impact] of the Sustainable Development Goals (SDG’s) have also incorporated the disaster risk component and the need to create resilient States. It’s a no-brainer then that the success of these development frameworks is strongly linked to our ability to reduce disaster risks, mitigate possible effects and greatly increase our coping capacities and preparedness. What then must African states do in order to build resilience? Over a five-part series in the coming weeks, we shall explore five key elements central to disaster risk reduction and resilience. The first of these elements is Information. Scolobig, et al  point out that while the history of disaster risk reduction and management is a long and convoluted one, only by the late 1970s had governments begun to truly institutionalise disaster risk management processes and practices. Responsibility rested almost exclusively on organisational shoulders and the public was perceived as passive receivers of technical information on risk assessment, preparedness measures, emergency plans, etc. In 1994, governments came together as signatories to the Yokohama Strategy with the desire to address growing natural hazard vulnerability and increasing disaster losses. While response remained important under the strategy, effective disaster risk reduction had to be complemented by the integration of prevention, mitigation and preparedness measures. This opened up the field to a far broader gamut of stakeholders – from government to the private sector, international organisations, non-government bodies and civil society. In this new atmosphere, multi-stakeholder interaction in decision-making (and even policy development) became fundamental. The right to information and citizen awareness have further been embedded in the successive instruments on disaster risk reduction: Hyogo framework [2000-2015] and the Sendai Framework [2015-2030]. Rather than being vulnerable, people can be capable, able to protect themselves and resilient. Judith Rodin, C.E.O of Rockefeller Foundation in her book, The Resilience Dividend, illustrates the importance of awareness as being an essential aspect of resilience building because one must know what their strengths and assets are, what liabilities and vulnerabilities they have and what threats and risks they face, in order to effectively prepare for disruptions, respond to them and bounce back from them. She also illustrates the non-static nature of information. “Secondary effects proliferate, circumstances change rapidly. Therefore there is a constant need to evaluate, assess, take in new information, reassess, and adjust our understanding of our evolving environment”. Information is scattered among various agencies and institutions with limited coherence, coordination and sharing. Limited analysis has been done to understand the trends, spatial and temporal impacts of potential disaster risks and their impacts. Risk information is not systematically used for policy and decision making. There is little integration of knowledge systems at regional, national and community levels. There is inadequate collaboration between the different organizations working in DRR or related areas such as CCA and the environment. Civil society and private sector involvement is also often limited. Creation of multi-stakeholder communities where robust conversations surrounding disaster risk reduction and resilience can be had and information collected and shared is critical. Creation of synergies between key players such as governments [at regional, national and community levels], policy makers, civil society, private sector and regional institutions and mechanisms such as IGAD (CEWARN) & AU-DREA will play a key role in integrating knowledge systems, making informed decisions, developing & implementing policies and strategies. Disasters can be substantially reduced if citizens are well informed and motivated towards a culture of disaster prevention and resilience, which in turn requires the collection, compilation and dissemination of relevant knowledge and information on hazards, vulnerabilities and capacities in ways that make it easier for them to understand.